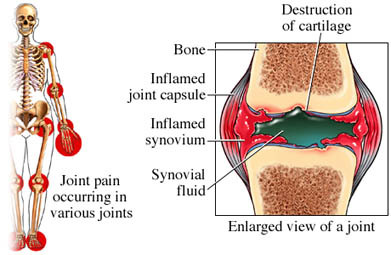 What are the risk factors for rheumatoid arthritis?What are the symptoms of rheumatoid arthritis?How is rheumatoid arthritis diagnosed?What are the treatments for rheumatoid arthritis?Are there screening tests for rheumatoid arthritis?How can I reduce my risk of rheumatoid arthritis?What questions should I ask my doctor?What is it like to live with rheumatoid arthritis?Where can I get more information about rheumatoid arthritis? Rheumatoid arthritis. Arthritis Foundation website. Available at: http://www.arthritis.org/about-arthritis/types/rheumatoid-arthritis. November 29, 2016. Rheumatoid arthritis. Merck Manual Professional Version website. Available at: http://www.merckmanuals.com/professional/musculoskeletal-and-connective-tissue-disorders/joint-disorders/rheumatoid-arthritis-ra. Updated August 2015. Accessed November 29, 2016. Rheumatoid arthritis. National Institute of Arthritis and Musculoskeletal and Skin Diseases website. Available at: http://www.niams.nih.gov/Health%5FInfo/Rheumatic%5FDisease/default.asp. Updated August 2014. Accessed November 29, 2016. Rheumatoid arthritis (RA). EBSCO DynaMed Plus website. Available at: http://www.dynamed.com/topics/dmp~AN~T115261/Rheumatoid-arthritis-RA. Updated September 30, 2016. Accessed November 29, 2016.